The first Army Air Corps navigational class at Miami University graduated in November 1940. In this book, Colonel Whitcomb follows these first celestial navigators through their World War II trials. Twenty-five personal stories paint the stories of these men as they fought—combining the ancient art of navigating by the stars with the equipment on their B-17s, became prisoners of war, lived through the Bataan Death March, escaped from Japanese captors, survived primitive conditions in the Philippines, died for their country, or later served the US as navigators on the aircraft of presidents and dignitaries. In November 1940, 44 young military cadets graduated from the first Army Air Corps Navigational Class at Miami University in Coral Gables, Florida. The cadets came from all parts of the United States-from the urban areas of the East Coast, westward to the Appalachian Mountains, to the Midwest and prairie states, to the Rocky Mountains, and the West Coast. These young men came from the inner cities, the farmlands, the mountains, and coastal regions, and they were all volunteers. Most were college-educated and in the prime of life. World War II was raging in Europe and it was becoming increasingly difficult for the United States to remain neutral. A few farsighted men in our small Army Air Corps saw the essential requirement for trained celestial navigators in our military aircraft. The instructor for this navigational class was a 34-year-old high school dropout by the name of Charles J. Lunn. Charlie Lunn had first learned the art of celestial navigation aboard freighter ships in the Caribbean and later as the navigator aboard Pan American Airline planes flying to Europe and Asia. 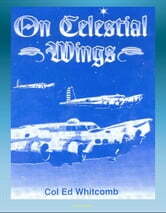 This book was written by one of those young navigators, Edgar D. Whitcomb, from Hayden, Indiana. Ed Whitcomb tells about these young comrades-in-arms and draws vivid word portraits of them as we learn of their assignments to Air Corps units. We learn how they survived and how some died in World War II. We learn about Ed's own pre-Pearl Harbor assignment with the 19th Bombardment Group at Clark Field in the Philippines and the unfortunate, and perhaps inexcusable, decision not to deploy our B-17 Flying Fortress bombers immediately after the attack on Pearl Harbor resulting in the loss of 40 percent of those aircraft as they sat parked at Clark Field when the Japanese destroyed that vital military air base on the afternoon of 8 December 1941.